What a weekend at Turner Field! It totally felt like the playoffs with a packed house every night. The ball park was electric!! Great vibe, great baseball and great, great fun! 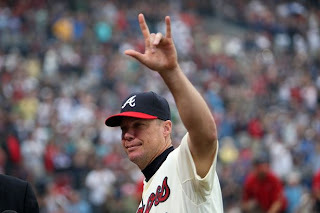 Over 150,000 fans were in the house, most of whom were there to say thank you to Chipper Jones. They travelled from far and wide, they brought signs and they were LOUD! Next to me Friday night, a couple from Illinois. Saturday, Louisiana. Sunday, New Jersey. They all travelled for one reason and one reason only. To see Chipper Jones at Turner Field. Honestly, I don't even know where to start with this post. There are so many thoughts rushing through my head and so many emotions running every which way. I'm always sad when the final home stand comes around but at the same time I'm excited as the playoffs are just around the corner. As much as this weekend was about playing into late October it was even more about saying thank you to Chipper. The Braves do a lot of things very right. Ceremony is at the top of the list. I've been to five number retirement ceremonies, a ceremony honoring Skip Caray, another honoring Bobby Cox and now, one honoring Chipper. Friday night's ceremony was perfect! From having Pete Van Wieren as the master of ceremonies, to the video tributes and the eloquent speeches, to the wonderful gifts, all leading up to the incredibly heartfelt words of Chipper himself, it was a truly memorable ceremony. If you were there, you'll never forget it. I'm not one who's all about the gifts but I was blown away by the thought that went into each and every gift that the Braves gave Chipper. From his teammates, a custom billiard table. The perfect guy gift. In addition, they all wore mock turtlenecks under their jerseys just as Chipper always does. We later learned that the team refers to them as nerdlenecks. I guess Chipper doesn't command respect for everything. From the organization itself, the gifts reflected Chipper's impact on baseball, the Braves and the city of Atlanta. Representing his play at third base, Chipper was first given one of the special bases that were created specifically for the game. Representing his impact on the community, John Schuerholz then announced the "10 for 10" project in which the Braves will refurbish ten little league baseball parks in Chipper's name, in and around Atlanta. Representing the foundation he created as a cornerstone of the team, Chipper was then given a beautiful plaque featuring a home plate created from bricks taken from the facade of Turner Field. A matching plaque will hang from where the bricks were taken. Mr. Schuerholz continued on to say that Turner Field was certainly Chipper's home away from home, and to honor that the team is giving him his clubhouse locker. What an incredibly cool gift! That one put an even bigger smile on Chipper's face! And finally, because he has had to spend so much time away from his family, the Braves are giving Chipper and his family a trip to Hawaii. An amazing array of gifts that really represent every aspect of Chipper's role with the Braves. Chipper was the final speaker and he truly spoke from his heart. He was so appreciate of those who made this journey with him and helped him to achieve his boyhood dream. Here's a link to the entire ceremony, courtesy of the Braves. It's well worth the watch. I really didn't intend for this post to be this long and I will never, ever be able to find the right words to convey how special today's game was. It began with a message from Chipper played on Braves Vision. I'll admit it, I shed some tears. As impossible as it seems, the cheers for Chipper were even louder today. At the start of the game, he took the field alone. The cheers were deafening and the outpouring of appreciation was overwhelming. I saw the Braves stoic leader wipe his eyes more than once. Chipper had said after Friday's game that he had been feeling a myriad of emotions and he was glad that the ceremony was over so that he could fully focus on the task at hand. He had gone hitless on both Friday and Saturday but that ended with a hit on Sunday. We were also soundly reminded that Chipper's not just a hitter. He made three absolutely stellar plays in the field, the third being the best. It's my favorite Chipper move, the bare-handed grab and side-arm throw to first to get the batter out. No one does it better. The game ended with a 6-2 Braves win and the team took the series two games to one. Freddi Gonzalez had asked Chipper three different times if he wanted to be replaced by a pinch hitter or a pinch runner so that he could walk off the field for one more thunderous ovation. Each time Chipper said no. He wanted to finish the game on the field with his teammates. And after the on-field post game interview, Chipper didn't take the steps down to the clubhouse. Instead he walked to the stands, to the seats behind home plate and gave his mom and his dad huge, huge hugs. It was so perfect. Thanking the two people who were there from the beginning. And in that moment, it was all too much for him. As he walked back to the dugout we all saw the emotions come tumbling out. We saw what this moment, this weekend, this team and these fans have meant to Chipper Jones. There are still three regular season games left to be played and the division has yet to be won. The regular season ends on Wednesday and the playoffs begin on Friday. And that, Chipper says, is when the fun begins! Earlier last week, if you happened to be out and about, doing a little shopping in Gaithersburg Maryland, you may have happened upon this item. Really!?! Hey Nats, that's a little insulting to the team a few states south of you! You may be leading the division but y'all haven't won it yet. Ok, I once worked retail and I know mistakes are made. The clerk stocking the shelves at Kohl's probably didn't know that this item was "time sensitive" and the celebratory shirts would have probably stayed out on the sales floor had a shopper not snapped a photo. I know what you're thinking. No. It wasn't me. I haven't been to Maryland in quite awhile. The Nats were three games up on the Braves and had lost seven of the last eleven when this story broke. 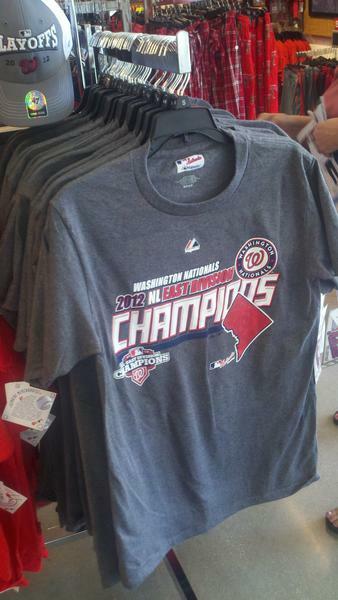 Many a Nats fan was blaming Kohl's for jinxing their team. I get it. I believe in the power of the jinx. Kohl's issued a statement, apologizing to the Nationals for the error. Kohl's only apologized for spoiling the surprise of unveiling the logo. I think that's off the mark. The retailer has 26 stores in the Atlanta area. Maybe another apology is merited? The last regular season home game is today. This is my fifth game in a row and the post season is on the horizon! The Ted has been packed and the energy has been over the top! SRO only today!! Bottom of the ninth, down one run, Chipper Jones on third base and a playoff berth in sight. The first walk off home run of Freddie Freeman's young career will will not only be seared into his memory, but into the memories of Braves fans everywhere. Another comeback win. Another one-run win. And perhaps a bit of personal redemption for the Braves first baseman. As soon as the bat hit the ball, we heard it. That magical sound! The sound that only a home run makes. Everyone knew it. It was a blast that sailed over the deepest part of the centerfield wall. His teammates spilled out of the dugout and raced to meet him a home plate. Chipper turned and watched. As soon as the ball cleared the wall, his fist went up into the night air and I swear, he almost seemed to bounce home with the joy and excitement of a little leaguer. And Freddie, he ran the bases faster than he ever has before. After he rounded third, he literally leapt to home plate. And then the dirt-filled melee ensued!! The redemption? It dates back to last September, back to the final game of the regular season. The game that the Braves lost. The game that kept them from the playoffs. Most people remember the September unravelling. The skid that caused the season to come down to one final game. Freddie Freeman remembers something else. He remembers that he was the last batter in that final game. He hit into a double play and made the last out. The ball reached Ryan Howard's glove before Freddie made it to the bag. He threw his batting helmet in disgust and the Braves season ended with a whimper. I don't think Freddie spent the off season dwelling on it. But I do think that it ticked him off. No one wants to be the guy who makes the final out, especially someone as driven as Freddie Freeman is. Tonight, he got his redemption. And it tasted like champagne! Last Wednesday, two legends in-the-making passed two long-time legends in baseball's record books. In New York, the Blue Jay's Omar Vizquel tied and passed Babe Ruth on the all-time hits list. Omar now has 2,874 hits to Babe's 2,873. It's rather ironic that Omar passed Babe on his home turf (sort of). Later that evening in Miami, the Braves Chipper Jones tied Lou Gehrig with 2,721 hits. Yesterday in Philly, Chipper passed Lou on the list with two more hits. So overall, where do these players all stand among baseball's most prolific batsmen? Derek Jeter is the only active player on the list. When you consider the level at which Derek's still playing and then combine that with his good health, I believe that the Yankee's captain will easily crack the top ten, maybe even moving up more than one spot. What else can I say about this list? Well, it's a whole lotta hits!! Last Wednesday night in Milwaukee, in the top of the fourth inning, Chipper Jones walked for the 1,500 time in his career. And that walk walked him right into the history books. All these milestones were reached while hitting .300, with a .400 on-base percentage and a .500 slugging percentage. Who did Chipper join? Babe Ruth, Lou Gehrig, Stan Musial and Ted Williams. It's inconceivable to me that there are still some people out there who actually think that Chipper Jones is not a first round ballot Hall of Famer. They exist. I've seen them. I've spoken to them. And I've told these people that they are nuts! Only if you're an opposing batter! I don't believe that we can compare baseball players and baseball teams of different eras head-to-head. It's like comparing apples and oranges. Would the 1927 Yankees be able to beat the 1998 Yankees? There's no way of knowing. Sure it makes for a lively debate but there is never a right or wrong answer. That said, I think it's really cool to look at a player's accomplishments and see how they stack up historically with others who played that same position. This is my very roundabout way of getting to Kris Medlen. In the Braves September 14th win over the Washington Nationals, Kris Medlen struck out 13 batters. In the Braves win over the Colorado Rockies on September 3rd, Kris struck out 12 batters. With those two outings, Kris became the first Braves pitcher since 1900 to have a pair of games with 12 or more strikeouts in the same month. When you consider all the Braves pitchers since the team's inception, let alone the past two decades, that stat is absolutely mind blowing! The Braves offense kicked back into high gear yesterday and two very important bats woke up in a big way, leading the team to an 11-3 win over the Mets. After a season of scuffling and struggling, Brian McCann went four-for-five with four RBIs and he scored three times. B-Mac's highlights included a two-run double in the third inning and a two-run homer in the fifth. That's his first long ball since July. His thoughts? "It felt like the first time in a while that I've actually made an impact on a game. It felt good." After being benched by Fredi Gonzalez early last week, Dan Uggla went three-for-three and walked twice. Dan crossed the plate three times. That much-needed performance followed an equally good outing on Friday, where Uggs doubled and homered in a 3-0 win over the Mets. Dan's reached base in his last seven plate appearances. He's been a streaky hitter ever since joining the Braves and if there is ever a time to get on hot one, it's now. Eric Hinske came off the bench and hit a solo home run in the eighth inning and Martin Prado had his 52nd multi-hit game of the season. It was nice to finally see some relaxed smiles throughout the dugout. Kris Medlen's strong outing was limited to six innings due to the lengthy rain delay. He gave up two runs which ended his streak of not allowing an earned run in 40 1/3 consecutive innings. Kris said he didn't feel as "crisp" as he has recently but it was still a good outing. Chipper's not in the starting line-up today as the knees are acting up. That said, Chipper said he wants to be the first player called upon to pinch hit. He has to get into the game. I want (and need!) to hear that "La-Ree" chant one more time. Although, last night I swear I heard "Chipper" being chanted instead of "La-Ree" as well as the Braves chant near the end of the game. Did y'all hear it? Ok, I need to wrap this up quick. Chipper just brought out the line-up card to a thunderous ovation, that's after being mobbed leaving the hotel this morning. I don't want to miss a second of this one! Gotta brody! I'm disappointed. Not with the gift but with the presentation. Or lack thereof. I wanted to see the presentation. I wanted to see the looks on the faces of all those Mets fans. I wanted to hear the boos and listen as the "La-Ree" chants rained down upon Chipper Jones. I wanted to hear heckling before even one pitch was thrown. It was the first game of the final series that Chipper Jones will play in New York versus the dreaded Mets and the moment didn't happen. We were robbed. Don't get me wrong. I don't want to pour salt into those old, festering wounds, but the relationship that the New York Mets fans have with Chipper Jones is one that's famous, or more appropriately, infamous. It's a relationship that's been well documented over the years. Tonight, Mets fans were denied a huge opportunity to put their feelings on display for all of baseball one final time. Early in the season, when presentations were made in Houston and Denver, the obvious question arose. Would the Mets acknowledge Chipper Jones' retirement? Would it be insulting to Mets fans to honor Chipper on the field during that final series? How would Mets fans react? It turned into quite a brou-ha-ha. The Mets presented Chipper with a piece of artwork that highlights all he accomplished at Shea Stadium. The presentation took place Friday afternoon in a conference room somewhere at Citi Field, away from the field and away from the fans he tormented. I found that disappointing. The fans deserved to be a part of it, for better or worse. Yes, it was relationship built on extreme dislike but it grew into one of mutual respect. You can dislike someone while at the same time appreciate their accomplishments. That is what the relationship between Chipper Jones and New York Mets fans has grown into. Chipper was asked about it today. If he were a Mets fan, would he like Chipper Jones? With a wry smile Chipper replied, "I would respect the body of work, but I'd hate my guts." The Mets honored Chipper in the manner they felt was most appropriate. I respect that and I'm certain that it was a very classy presentation. I just wish the Mets fans could have been involved. The booing, the chants, it would have been perfect. And without a doubt, Larry would have loved it! It's no surprise to anyone in Braves Country, or anyone who follows baseball for that matter, that Kris Medlen was named the NL's Pitcher of the Month for August. Kris had a brilliant month and he's been nothing short of stellar since coming back from Tommy John surgery. So what exactly did Kris do to earn the POM honor? Everything! - He didn't allow a run for 28 1/3 consecutive innings from August 11-28. That's the longest streak by any Braves pitcher this season. 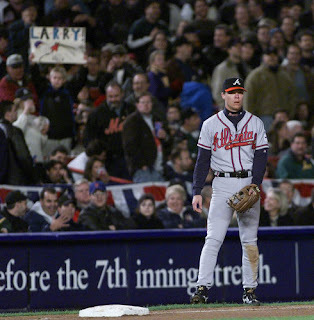 It's also the longest in Braves history since Greg Maddux recorded 39 1/3 straight shutout innings from September 2-28, 2000. Certainly nice company to be in! - In addition, Kris allowed only two earned runs in 35 2/3 innings. - His record was 4-0, three of those four games were scoreless. - He recorded 35 strike outs. - He picked up his second win in only his third start on August 11th against the Mets, allowing just one run in over 6 1/3 innings. - He pitched his first career shutout on August 16 with a 6-0 win over the Padres. He gave up only five hits and struck out six. Since rejoining the starting rotation (after 38 relief appearances), Kris has gone 6-0 with a 0.54 ERA, recording 50 strikeouts and only five walks. He hasn't allowed more than one run in any of his seven starts. Not too shabby!! So, do you think you maybe need to get to know Kris Medlen better? The Braves and Rockies wrapped up their final meeting of the season today. The Colorado club played the Braves tough, much tougher than one would expect when looking at their 56-80 record. The Braves won the series 3-1, winning the last two games by the same score, 1-0, which leads to a few interesting stats. - The Braves haven't won back-to-back 1-0 games since 1971. - The Rockies have never lost 0-1 back-to-back. Ever. - In both of these Braves wins, the run that scored was unearned. Tim Hudson pitched a gem of a game and once again proved why he's the ace of the Atlanta staff. And Tim didn't disappoint in his post-game interview either. When asked about the odd error that led to Juan Francisco scoring the Braves sole run, Huddy said with his trademark smirk, "Lucky we had our fastest runner on third. Now you know why we call him Roadrunner." Nice! 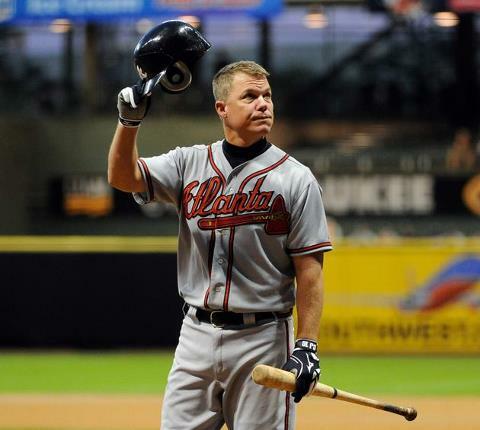 The Rockies' Jason Giambi had very kind words for Chipper Jones. Commenting on Chipper's final season Jason said, "I'm ecstatic for him. That's the way you want to go out. What an incredible last year that he's had. It's been fun to watch him go about his business. It's been a tremendous honor to play on the same field with him." And you know Chipper loved that thin Denver air! You NEVER, EVER Leave Early!! Sunday's Braves/Phillies game was mind-blowing!! I hope all those who left early learned a valuable lesson. That lesson? You never, ever count the Atlanta Braves out of it. Know why? Because the Braves never believe they're out of it until the final out is made. Chipper Jones said it best in his on-field interview after he hit the walk-off home run. "Thank you to all these fans for sticking around and believing in us. For those that left, shame on you, you missed a great one." Yes they did. Sure, it started off miserably. Not just dropping the first two games of the series, not just the five runs that the Phillies put up in the top of the first, but the night itself was totally miserable. Very hot, very humid, very summer in Atlanta. Paul Maholm had a very rough (and a very short) outing. It happens. But still, the Braves didn't give up and they chipped away. If not for that last at-bat, Reed Johnson would have been the Braves's MVP, driving in one run in the second inning and two in the sixth. The top of the ninth foreshadowed the excitement to follow when Peter Moylan took the field in his second game back. He didn't disappoint! In the bottom of the inning, the Braves did what every little leaguer is taught to do. They played small ball. And it paid off in a huge way! Yes, a lot of folks left early. The Braves were down by four with Jeremy Horst on the mound and Jonathan Papelbon on the way in. Yes, it looked grim. But you don't give up on your team. And seriously, why not stay? It wasn't late, most people didn't have to get up for work the next morning, the kids didn't have school and, at that point, you're already going to be sitting in some traffic. So why not stay? I know one thing for sure. Those who left early and heard the end of the game on the radio, huge regrets. Those who left missed smart at-bats from Paul Janish, Reed Johnson and Michael Bourn. What did that do? It set a beautiful table for Martin Prado and he brought the Braves two runs closer. And then the stars aligned. In the next at bat, yet another chapter was written in the Chipper Jones storybook season. I don't even have to tell you what happened. No doubt you've seen replays. And if you're one of the people who left early, every time you hear the call, it makes you feel sick to your stomach. You missed the moment. Me, I feel great! That's because I didn't leave. I never leave. The Believers, we stay. We chopped, we chanted, we jumped, we screamed and then we hugged. In fact, I hugged a total stranger! No one wanted to leave. No one wanted that feeling of euphoria to end. It was shades of the early '90's, happening 20 years later. It's just as sweet and as exciting now as it was then. If you want to see it one more time or watch it over and over again, here's a clip of the game winning home run. The hit is courtesy of Chipper Jones. The video is courtesy of the Atlanta Braves. The game winning home run was Chipper's first hit versus Jonathan Papelbon. He was 0-2 lifetime facing Papelbon, with one strike out. This hit was Chipper's 228th game-winning RBI, which is the most among active players. This is the second time this season that Chipper has hit a walk-off home run to beat the Phillies. The previous time was on May 2nd at Turner Field.